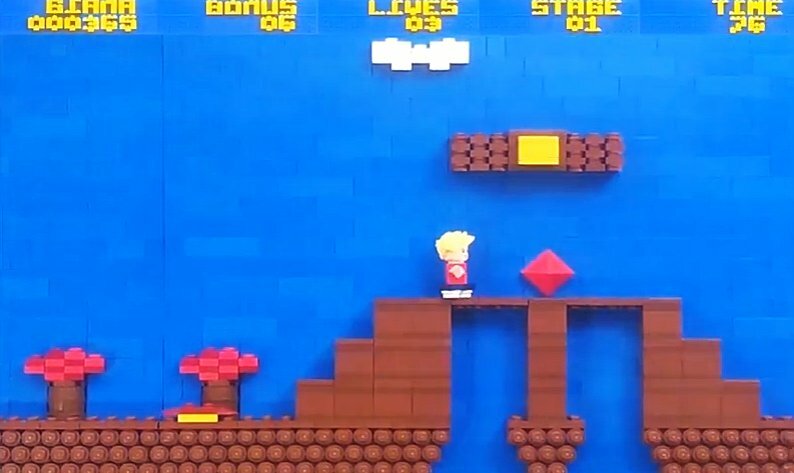 Indie Retro News: Giana Sisters - A retro gaming classic as you've never seen before... designed using LEGO! Giana Sisters - A retro gaming classic as you've never seen before... designed using LEGO! We've certainly heard a lot about that famous platformer the Great Giana Sisters from 1987 over the years, especially as it came back to the Amiga through Reimagine games as an awesome overhaul called ' Giana Special Edition '. But have you ever seen the game designed in Lego? Well now it's time to surprise you, as a Youtubber by the name of Lego Gameplay Retro Classic has converted the first stage using Lego pieces that is completely animated! The entire process was used on a Smartphone for the pictures, and cut and stretched to about 10% in length with Paint.net to get a 10/16 format. Also according to the uploader, the Lego setting was about 200cm long and 20cm high, with 3 knobs in depth. Everything in the video even the writing on top of the screen including bonus points, was also made in Lego.